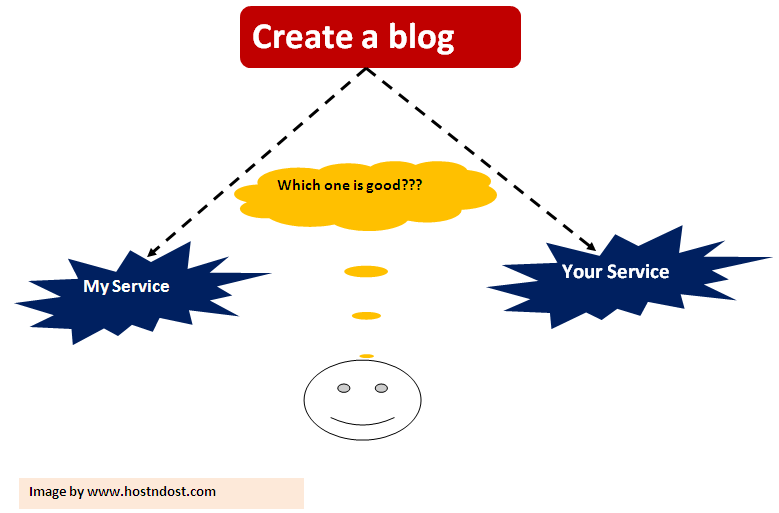 Welcome to the Hostndost, and today we will cover yours and my favorite topic “ How to create blog and earn money”. Don’t worry we will cover step by step tutorial, and we will go hand to hand without any confusion. Yes, I have something excited for you. You can create a blog by two ways, and both are having their own valid points. My service – I will create a blog from scratch for you. Your service – You can create blog and earn money from the same. Now let’s see the difference and importance in a very simple term. Cheap – I will only charge for my service, and you can avail the benefits for 3 years or for the 5 years. Unlimited bandwidth – Unlike other shared hosting services, you will get unlimited bandwidth here. Unlimited web space – You will get unlimited space for your dream to earn money. 99% Uptime - You will get 99% uptime guarantee. Security – Like other web hosts, you will not see any security loopholes. A totally secured website you will get. No resource limitation – You will never face any resource limitation issues, like CPU usage, I/o usage, entry process and etc. If you are a new to online business, then first research about the web host or ask customer support about the resource limitation problem. It will let you clear what I am trying to say. I will create a blog from scratch for you, and you can either go for the 3 year or 5 year plan option. Custom Domain name – If you have custom domain name, then just pay $150 for 3 year plans. The renewal price after 3 year will be just $50. It means, you will pay less as compared to the other web hosting service providers. No Custom domain name – If you don’t have a custom domain name, then you have to pay $220 for 3 year plans. The renewal price will be just $120, and again it is on the lower side. Custom Domain name – Again, if you have a custom domain name, then just pay $250 for 5 years. The nenewal price will be just $80. No custom domain name – If you don’t have your own custom domain name, then with custom domain name the price will be $320 for 5 years. The renewal price will be $220, and you can see how cheap it is as compared to other web host services. · Monetize your blog via ad networks. · Use Google Adsense program. · Paypal – You can use paypal to make the payment in a secured way. · Electronic fund transfer – You can transfer money via EFT. · Cheque – You can make payment via cheque as well (Only for Indian people). Note: Fill the contact us form for any query. Custom domain Name – First select domain name, and have to pay price for it. Shared hosting plans – Now this part is the costlier one because more features means more prices you have to pay for the plan. Unlimited web space – You will get unlimited web space, and it depends upon the plans and the web host. Unlimited bandwidth – In shared hosting you will see may web hosts offering unlimited bandwidth. But in reality you will not get unlimited. Uptime guarantee – Most of the web host will offer you 99% uptime guarantee, and most probably they will full fill it as well. Not all web host, but some reputed one for sure. Security issues – If you will go for shared hosting plan, then it means you will be sharing resources with other website owners. If any website will see security threat or has been compromised, then it will affect other website on that server. For creating a blog, the best web hosting provider is Bluehost. Even WordPress has recommended bluehost. So we will suggest you to go for either Bluehost or Hostgator. · Bluehost @3.49/month. – Get Bluehost plans @ 3.49/month by using this discount link. · Hostgator @0.01/first month. – You can try shared hosting plan at hostgator for just one cent. If you will not like their service, then get full return of money even after 40 days. Here, you have use our discount coupon code (SharpLesson1cent) to get website for 1 cent. We have just covered how to create blog and earn money. I have given you two ways to create your website, now decide which one you wish to go. If you want cheaper one, then go for the Bluehost or hostgator, and if you wish to have much cheaper web hosting services, then try mine one.